(Newser) – Adolf Hitler's manipulation of the German people may have begun long before he came to power. Back in 1923, when he was the leader of a fledgling Nazi party, a biography surfaced calling him Germany's savior and comparing him to Jesus. Adolf Hitler: His Life and His Speeches came out as authored by German war hero Adolf Victor von Koerber. In fact, the author was Hitler himself, according to historian Thomas Weber of Scotland's University of Aberdeen, per the New York Times. 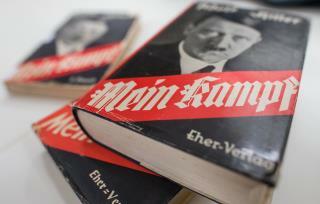 The book came out two years before Mein Kampf launched Hitler into national prominence, and it suggests he had designs on leading the country longer than historians have thought. Nobody has ever given me an answer to a question that makes good sense. The jews celebrating passover where all the non jews first born was slaughtered and the jews spared...is that really something to celebrate? And if so, maybe gentiles should celebrate Kristallnacht as only jews were targeted and gentiles spared. The worst thing of all was that this madman looked rational enough to fool an entire generation of people who wanted to be fooled. HITLER WAS A MENTAL CASE!!!!!! !